To modify your server's settings, add or modify the following lines in your hosting.cfg file after stopping your server. Below is a list of settings that can be used. Replace 'X' with either a number value or with words. Settings that can include words, spacing, etc. have quotes between the 'X' value. 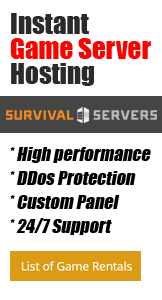 Server url to display when players join the server. This is a briefly displayed message. Directly after the equals sign, add in the mod IDs from the mods you want to run on your server, separating each by a comma. This page was last modified on 22 March 2019, at 06:11.